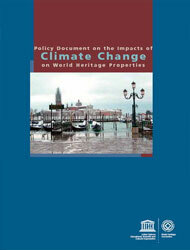 World Heritage properties are affected by the impacts of climate change at present and in the future. Their continued preservation requires understanding these impacts to their Outstanding Universal Value and responding to them effectively. World Heritage properties also harbour options for society to mitigate and adapt to climate change through the ecosystem benefits, such as water and climate regulation, that they provide and the carbon that is stored in World Heritage forest sites. Cultural heritage, on the other hand, can convey traditional knowledge that builds resilience for change to come and leads us to a more sustainable future. World Heritage properties serve as climate change observatories to gather and share information on applied and tested monitoring, mitigation and adaptation practices. The global network of World Heritage also helps raise awareness on the impacts of climate change on human societies and cultural diversity, biodiversity and ecosystem services, and the world’s natural and cultural heritage. 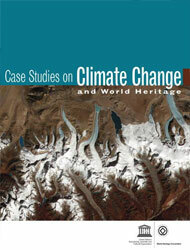 Institutional frameworks for climate action within the World Heritage Convention The issue of the impacts of climate change on World Heritage natural and cultural properties was brought to the attention of the World Heritage Committee in 2005 by a group of concerned organisations and individuals. The Committee requested (Decision 29 COM 7B.a) the World Heritage Centre, in collaboration with the Convention’s Advisory Bodies, interested States Parties and the petitioners, to convene a broad working group of experts to review the nature and scale of the risks arising from climate change and prepare a strategy and report for dealing with the issue. In taking this decision the Committee noted ‘… that the impacts of climate change are affecting many and are likely to affect many more World Heritage properties, both natural and cultural, in the years to come’. 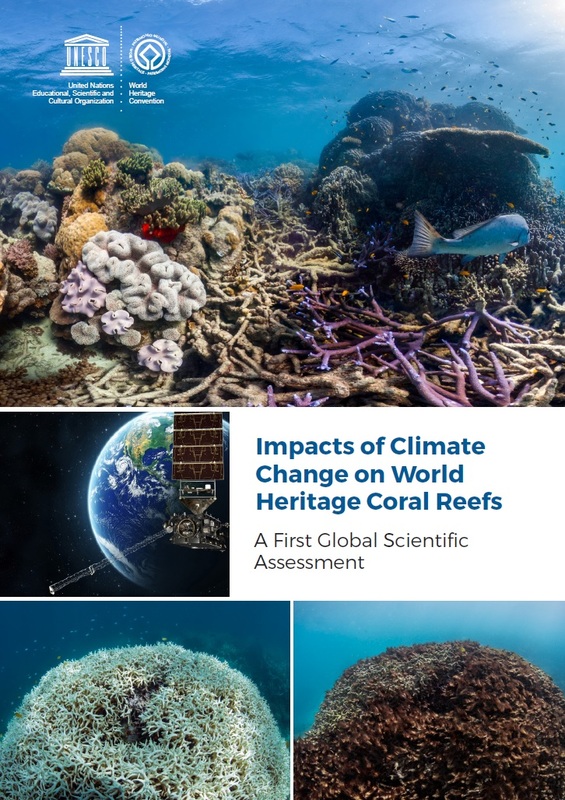 The group of experts prepared a report on “Predicting and Managing the Effects of climate change on World Heritage’, as well as a ‘Strategy to Assist States Parties to the Convention to Implement Appropriate Management Responses”. The Committee reviewed and endorsed these two documents at its 30th session (Vilnius, 2006) (Decision 30 COM 7.1), and requested all States Parties to implement the strategy so as to protect the outstanding universal values, integrity and authenticity of the World Heritage properties from the adverse impacts of climate change. 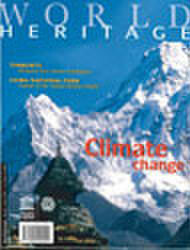 The Committee further requested the World Heritage Centre to develop, through a consultative process, a draft policy document on the impacts of climate change on World Heritage properties to be presented at the 31st session, and discussed subsequently at the General Assembly of States Parties in 2007. Accordingly, a Working Group meeting, comprising several experts and representatives of convention secretariats, was convened by the World Heritage Centre at UNESCO Headquarters in Paris on 5-6 February 2007. The draft ‘Policy Document on the Impacts of Climate Change on World Heritage Properties’ was prepared following this meeting and reviewed by various experts, practitioners, as well as representatives of international organizations and the civil society. This draft Policy Document was discussed at the 31st session of the World Heritage Committee (Christchurch, New Zealand, 2007). The views expressed at the Committee were incorporated, and the revised Policy Document was presented to the General Assembly of States Parties at its 16th session (UNESCO, 2007). The General Assembly adopted the Policy Document and strongly recommended its use by all concerned. It also encouraged UNESCO and the Advisory Bodies to disseminate widely the Policy Document, the Report and the Strategy, including to the general public, and to promote their application. Since then, climate change has been a recurring conservation issue affecting the World Heritage properties around the world. 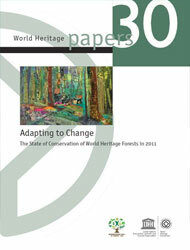 In its Decision 39 COM 7 taken at its 39th session (Bonn, 2015), the World Heritage Committee acknowledged that World Heritage properties are increasingly affected by climate change, and encouraged States Parties to participate in the 21st Conference of the Parties (COP21) to the United Nations Framework Convention on Climate Change (UNFCCC) in December 2015, with a view to achieving a universal climate agreement and mobilize global climate action on the ground. The Committee also recalled its Decision 31 COM 7.1, adopted at its 31st session (Christchurch, 2007) in which it adopted a “carbon neutral policy, in view of its application for all future sessions, to the extent feasible”. 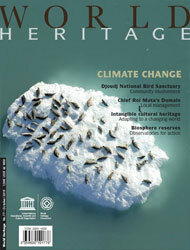 UNESCO has been at the forefront of exploring and managing the impacts of climate change on World Heritage. 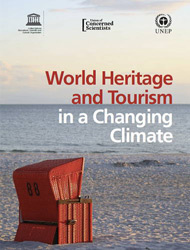 In 2006, under the guidance of the World Heritage Committee, it prepared a report on Predicting and Managing the Effects of Climate Change on World Heritage (2007), followed by a compilation of Case Studies on Climate Change and World Heritage, and a Policy Document on the Impacts of Climate Change on World Heritage Properties in 2008. 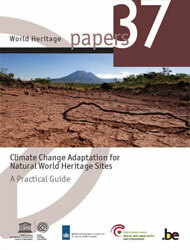 In May 2014, it published a practical guide to Climate Change Adaptation for Natural World Heritage Sites and continues to build the capacity of site managers to deal with climate change. have focused on issues of climate change and resilience. 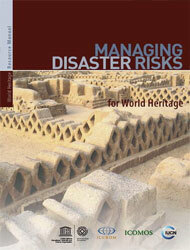 Reducing Disasters Risks at World Heritage Properties and World Heritage and Sustainable Development. UNESCO builds capacities of States Parties and other stakeholders to manage climate change impacts on World Heritage effectively and sustainably. The main aim of these efforts is to increase the capacity of these properties to continue to convey their Outstanding Universal Value and support sustainable development. Management of resilient World Heritage properties requires designing and implementing appropriate adaptation measures, complemented by activities that contribute to disaster risk management, climate change mitigation and sustainable development. In 2014, UNESCO supported capacity building of World Heritage site managers in Latin America and Africa on climate change adaptation for natural World Heritage based on the methodological guide developed. Four natural sites (2 in India and 2 in Kenya) took part as pilot sites in the preparation of the guide. These activities received financial support from the Netherlands Funds-in-Trust, the Flanders Funds-in-Trust and the Government of Belgium. UNESCO has also supported specific World Heritage sites on climate change adaptation and mitigation activities, including in Peru and Indonesia. threatening impacts of climatic, geological or other environmental factors. gradual changes due to geological, climatic or other environmental factors. threatening impacts of climatic, geological or other environmental factors. In addition, the factor or factors which are threatening threats and/or their deleterious impacts on the integrity of the property must be those which are amenable to correction by human action. In the case of cultural properties, both natural factors and man-made factors may be threatening, while in the case of natural properties, most threats will be man-made and only very rarely a natural factor (such as an epidemic disease) will threaten the integrity of the property. In some cases, the factor or factors which are threatening threats and/or their deleterious impacts on the integrity of the property may be corrected by administrative or legislative action, such as the cancelling of a major public works project or the improvement of legal status. 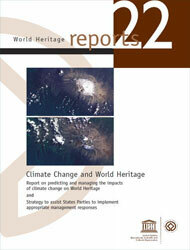 Requests the World Heritage Committee to institute a mechanism for the World Heritage Centre and the Advisory Bodies to periodically review and update the Policy Document, and other related documents, so as to make available the most current knowledge and technology on the subject to guide the decisions and actions of the World Heritage community. Urges the States Parties to participate in the United Nations climate change conferences with a view to achieving a comprehensive post-Kyoto agreement, and to fund and support the research needs as identified in the adopted Policy document. Further requests the Director-General and the World Heritage Committee to strengthen its relations with all organizations working with climate change particularly the United Nations Framework Convention on Climate Change (UNFCCC) and Intergovernmental Panel on Climate Change (IPCC) secretariats, and specifically with regards to the effect of climate change on World Heritage properties, with a view to delivering as one UN. 11. 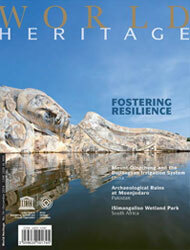 Also encourages UNESCO to do its utmost to ensure that the results about climate change affecting World Heritage properties reach the public at large, in order to mobilize political support for activities against climate change and to safeguard in this way the livelihood of the poorest people of our planet.